A collection of four Porsche supercars will be offered for sale at the 2017 Gooding and Company Amelia Island auction, to be held Friday, March 10 at the Omni Amelia Island Plantation Resort in Florida. The offerings include a Porsche 911 GT1 Strassenversion, Porsche 964 Turbo S Leichtbau, Porsche 997 GT2 RS and Porsche 997 GT3 RS 4.0. A 1998 Porsche 911 GT1 Strassenversion (Estimate Available Upon Request) will be featured at Gooding’s 2017 Amelia Island sale. The 911 GT1 Strassenversion is the only model ever offered from the factory as a race car first and then homologated for road use. The 911 GT1 race cars delivered remarkable results in motorsport, including a class and overall win at the 1998 24 Hours of Le Mans. Only 20 911 GT1 Strassenversions (street versions) were built for road use, and all were pre-sold to Porsche’s top clients. With over 530 hp, the GT1 Strassenversion offered world-class performance and featured spectacular aerodynamic bodywork built from exotic composite materials. Delivered new in Germany, this 911 GT1 is finished in its original Artic Silver Metallic livery and has less than 5,000 miles from new. Porsche GT1s seldom come up for public auction, and service records, books, original tools, and a Porsche Certificate of Authenticity accompany the sale. The Porsche 964 Turbo S Leichtbau was the first lightweight, turbocharged production model built by Porsche. This model was also the first entirely built by the Sonderwunsch (special wishes) and Motorsport divisions, and the first to carry the “S” designation. The 964 Turbo S Leichtbau is essentially a road-going model of the 1992 IMSA SuperCar Champion. Only 86 examples were built, of which only 67 are left-hand-drive, such as the 1993 Porsche 964 Turbo S Leichtbau offered in Amelia Island. A track-ready version of the 964 Turbo, every effort was made to reduce weight, including the removal of air-conditioning and radio. With long-term, single family ownership, this car is unmodified and has less than 1,400 miles on the odometer. This 964 Turbo S Leichtbau is finished in Speed Yellow exterior and is identical to the car displayed at the Porsche Factory Collection museum in Zuffenhausen, Germany. It is accompanied by the factory build sheet, service records, and a Porsche Certificate of Authenticity (Estimate: $1,300,000 – $1,600,000). The 997 GT2 RS was an effort between Motorsport and Exclusive divisions at Porsche. At the time of its introduction, it was the most powerful road vehicle ever built by Porsche, boasting over 620 hp, and was the first and only turbocharged model to ever carry the famous RS name. This 2011 Porsche 997 GT2 RS is one of 142 built for the North American market and one of 33 that have the combination of carbon fiber sport bucket seats and carbon fiber fenders. This GT2 was additionally optioned with a lightweight battery, lightweight headlights and sport steering wheel. Completely original, this black GT2 RS has been cared for by two owners from new, has traveled less than 3,000 miles and comes complete with service records, original window sticker and a Porsche Certificate of Authenticity (Estimate: $550,000 ­– $650,000). Porsche built 600 examples worldwide of the track-ready 997 GT3 RS 4.0, of which 158 were delivered to the North American market. 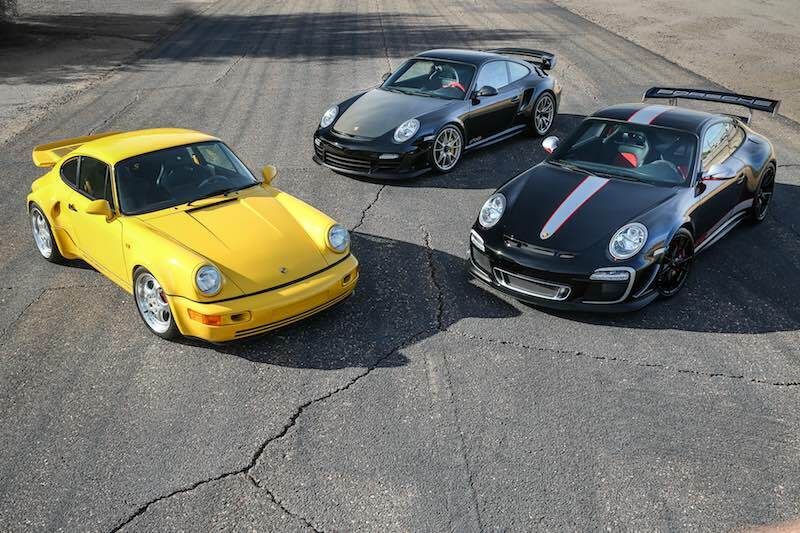 These cars have lineage to the 911 SC/RS and 964 RS 3.8 Porsches and were the ultimate track weapon that could also be driven legally on American roads. This 2011 Porsche 997 GT3 RS 4.0 is one of 12 ordered as a radio-delete model to further reduce weight, and one of two ordered in black. This GT3 RS 4.0 also has many special-order options and has traveled less than 130 miles since new. It comes with the original window sticker, all original books, manuals, service records and a Porsche Certificate of Authenticity (Estimate: $650,000­ – $750,000). Bidder Registration: $200 includes a catalogue, admission for two to the viewing and auction with two reserved seats, subject to availability. For further details, visit GoodingCo.com.